Buscando en el grupo Anthrodesign de Yahoo, me encontre esta Maestría/Diploma en Escocia. 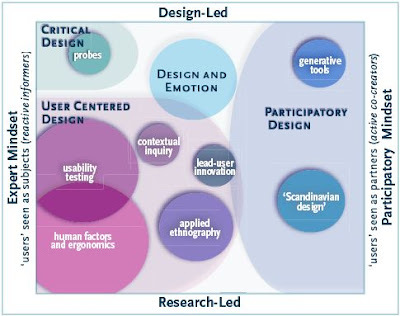 The MSc/Diploma in Design Ethnography* addresses an industry need for user researchers and design ethnographers who are sensitive to the complexities of delivering high value user data and insight, particularly in global and multi-cultural settings. The challenge is both to gather and represent data and insights on design requirements, and to leverage these into industry design processes. This is a full-time course, with entry in September of each year. The Diploma is taught over 2 semesters (9 months), the MSc over 3 semesters (12 months). The first two semesters are taught on campus in Dundee. The third semester is a major field study project, which can be undertaken anywhere in the world and supported and assessed electronically where necessary. 1. Design Led Product and Service Innovation. Explores through hands-on projects the design lifecycle, and the latest methods for design innovation. 2. People and Design. Challenges students to reconsider ‘everyday’ visions of technology as ‘stuff which is imposed on people/society’ and of designers as the ultimate authors of all new technologies or services, using cultural theory as a lens through which to view a number of case studies of new technologies/services as they appear in the world. 3. Design Ethnography 1. Explores the tools, theories and methods used in ethnographic studies in industry settings, and some of the issues and controversies surrounding the field. 4. Research Innovation: Inter-disciplinarity is a key concept in research in both academic and corporate settings. This module engages students with the challenge of creating and selling truly inter-disciplinary research projects to commission research. 5. HCI and Usability Engineering. A broad introduction to human-computer interaction through study of the components, both human and machine, which make up interfaces and the ways in which they interact. 6. Design Ethnography 2. This module considers the issues and difficulties inherent in translating ethnographic insights into useful material for design from the perspective of the various design stakeholders. A major personal field-study project from either a self selected topic or a brief from our Industry Steering Group. *Scheduled to launch September 2008, subject to University approval. Gracias por la info, Gustavo. Se ve muy tentador el programa.